Designed for military, federal, state or local governments as well as Department of Defense contractors engaged in projects where National Security is an issue, the Dahle CleanTEC 41334 paper shredder is perfect for anyone requiring a higher level of security when disposing of sensitive information. The CleanTEC 41334 is a Security Level 6 machine with a cross cut shred size of 1mm x 4.7mm and able to reduce a single sheet of letter size paper into over 15,500 tiny particles. Equipped with the exclusive CleanTEC Filtration system, 98% of the fine dust particles are prevented from being released into the air. The simple-use command dial controls all of the machine's functions, such as when to replace the filter, and when the shred bag needs to be emptied. Also equipped with ESP (Electronic Sensing Protection), the CleanTEC 41334 senses how much paper you're trying to shred and won't allow sheet capacity to be exceeded. Designed to shred up to 5 sheets at once. The 41334 offers quick and easy destruction of confidential materials. Transcript: This is the Dahle Level P-7 41334 Small Office Shredder! 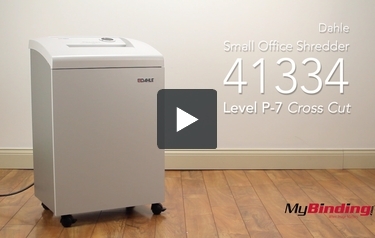 This is the Dahle Level P-7 41334 Small Office Shredder! The best thing about the 41334 is definitely its security rating. This cross-cut shredder has the highest rating possible: Level 6. Due to this, it's the perfect paper shredder for top-secret documents and it can be used by governmental agencies, defense contractors, and so on. The 41334 works quickly and it can shred up to 22 feet of material per minute, despite its 6-sheet shredding capacity. The feed opening is 10.25" wide, so it can accommodate both large and small documents. This shredder is part of Dahle's CleanTEC series, which means it's equipped with an air filtration system. This system helps keep paper dust out of the air, so your can office can remain cleaner. Since this machine has a 23-gallon waste bin, it's perfect for use in large offices. It would be helpful to place this device in a common area so everyone can have access to it. Size 1mm x 4.7mm 1/32" x 7/16" 1mm x 4.7mm 1/8" x 1 9/16" 1/8" x 1 9/16" 1/13" x 9/16"